Why Forgiveness is best healing tool ? Are you the type of person that brushes off an act of unkindness or do you hold a grudge for years? If you make a mistake, do you find it hard to forgive yourself or does it barely register? Learning how to forgive yourself & others has many mental & physical benefits, with scientific results to back up these benefits. So let’s look at why it is important to learn how to forgive yourself. Why learn how to forgive yourself? Another study looked at the connection between forgiveness &the mental and physical health of 148 young adults. As expected, there was a strong connection with high stress levels & health problems. But what was not expected was that in the cases where the young people showed forgiveness, in others & themselves, this connection disappeared. So when we don’t forgive, our bodies are vulnerable to stress in its most brutal form. When we do forgive, we somehow shield ourselves & are protected from the savage onslaught that stress has on our minds & bodies. Other studies show that it is a person’s feelings of anger & their ability to forgive that are important. Dr. Dabney Ewin is known as the Burn Surgeon & in the course of his career often dealt with severely burned patients. Some of his patients came in because of an accident, others through the negligence of someone else. Dr. Ewin used many unorthodox methods on his patients, including hypnotherapy, but he soon noticed that the majority of them were extremely angry at their situation. He began to realise that all their anger was interfering with their recovery, as their body would continually reject skin grafts. It was when Dr. Ewin started assisting his patients in the process of forgiving that he noticed a big improvement. He would explain to his patients that their feelings & thoughts were affecting their healing & would ask them to let go of their anger & replace it with forgiveness, for themselves or another person. The patients drastically improved with skin grafts ‘taking’ first time & healing times significantly reduced. He went on to teach his methods to other burns doctors & received many letters of commendations from around the world. There is a lot of evidence to support that you should learn how to forgive yourself, but how do you go about it? It’s all very well me sitting here, telling you that it is better for your mental & physical health to forgive, but what if the situation is simply too devastating? How do you forgive when someone has taken a loved one, or if you have unintentionally caused indescribable sorrow to others? The past is the past & there is nothing you can do to change it so don’t dwell on it. Understand that at the time you did the best you could under the circumstances presented to you. Look at your biggest regrets & tackle those, leave the smaller ones alone, you can’t sort out everything. Look at your core values & remember that you are a good person, perhaps you lost your way for a moment. See how you would have done things differently & visualise this in your head. Accept you made a mistake & make the point of moving on. Stop berating yourself, we all mess up in life, we are only human, it is time to turn over a new leaf & start again. 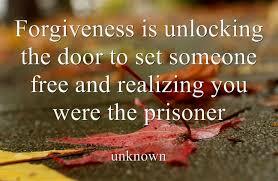 Remember, forgiveness is a process & is unlikely to happen in a few days, so give it the time it needs. Look at the situation from the other person’s point of view, perhaps they had no choice in the matter. Remind yourself that no one is perfect & we all make mistakes sometimes, even you. Forgiving doesn’t mean you are ‘letting the other person off’. They are still responsible for their actions. Forgiveness is something you do for yourself, not the other person. Forgiving someone doesn’t mean you do not think about the situation anymore. Look at who has forgiven you in the past & if you have hurt others. How would you feel if you have not been forgiven? 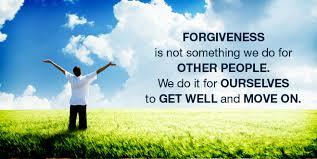 Forgiving someone might seem like the last thing you want to do right now. If you do not, however, it is like leaving a wound open, refusing to have it stitched up, and every day sticking a knife into it. It will never heal and cause you long-lasting pain. The person who suffers the most is us, while the offender more than likely moves on with their life. 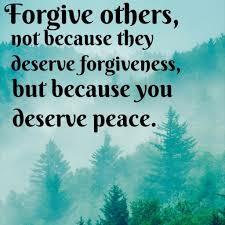 Forgiving allows us to move on also. If you learn how to forgive yourself & others then, we can all heal.